As 2014 comes to a close, I wanted to end the year with an original program of the month. 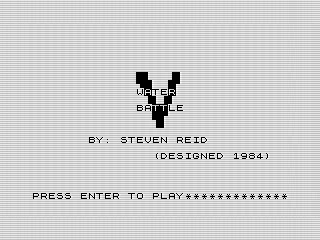 For December, that program is V Water Battle, an action game from 1984. For some reason, the title screen I created said designed instead of wrote but I did both. I was an odd duck in 1984. 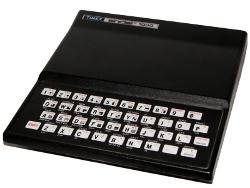 You use the Z and . keys to move. Use the M key to fire. The goal is to stop the ships from stealing the water. Miss them or get shot and its game over. Of course, they steal the water after each wave anyway to make it harder. Given that I havent beat it yet, the game is more difficult than it would seem. Let me know if you do! In case you werent around in the early '80s, NBC released the TV miniseries called V. If you were, you probably already figured out that this game is loosely based on a story from V: The Final Battle. The giant ship at the top is the alien mother ship, which you cant hurt. The little ships are trying to steal the water which is below your little service boat. Im pretty sure none of this game is actually represented in the show and the graphics bear little if any resemblance to the models used. It did, however, make for an interesting title. Plus I liked the show. The program itself isnt really doing much new. Youll find the base logic used is a lot like those found in many of the other programs Ive showcased before. It uses loops to manage the waves of action. It uses string arrays to store the ship graphics, even if not really needed since I dont change them. I definitely saw some places where I could have tighten up the programing, but otherwise the code is solid. I fixed a few minor flaws I noticed when I tested it out. The bullet you fire started too low causing it to flash over your ship. Fortunately it was an easy fix. I also had to guess at a few lines since the text on the thermal printout was fading badly in places. Im pretty sure it is working the way I intended it. Esthetically, the game isnt bad. There is good balance with the ship on top and the water below. The moving graphics are generally smooth and it is obvious what you need to do. The bomb that drops on you is a bit deceiving. It doesnt just drop straight down but edges towards you at times. This forces you to keep moving, adding to the challenge. I am particularly fond of the load screen graphics. They arent too pretentious and fill the screen nicely without being overwhelming. The use of inverted text works well and I like the overall use of white and negative space in the scene. Together with the decent presentation of the game itself, it is surprisingly good game that would work well today. Although, you might need to add a few more bombs.